Mattel Announces the Global Launch of Ever After High™ | Mattel Inc.
EL SEGUNDO, Calif.--(BUSINESS WIRE)-- The website in the third graph, second sentence should be EverAfterHigh.com (sted EverAfter.com). 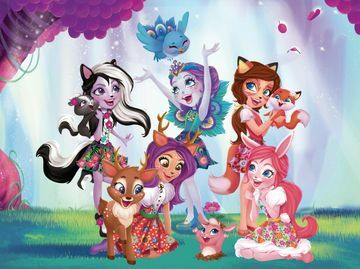 Turning a new page in fairytale history, Mattel announces the global launch of its newest intellectual property — Ever After High™. Based on the relatable everyday lives of extraordinary teenage sons and daughters of well-known fairytale legends, Ever After High™ features creative storylines and original characters, leveraging multiple platforms to reach consumers at every touch point. "Ever After High celebrates the idea that the story of your life is not written in permanent ink — our characters help convey to girls the importance of having the courage and confidence to make your own decisions and to create your own destiny," said Stephanie Cota, Senior Vice President, Global Brand Marketing for Mattel. "Ever After High is not like the fairytales you grew-up reading, these are new stories and new characters based on old favorites with modern twists." The new tween property is available in 14 countries and will continue to roll-out to more than 30 territories in 2014. In addition to the collection of an initial six beautiful and detailed fashion dolls, the property is supported by an immersive digital experience including a website, EverAfterHigh.com, global Facebook page and YouTube channel. The digital ecosystem includes animated webisodes, character bios, games, avatars and an interactive music video (a first for Mattel) that helps illustrate the brand message of choice - directed by legendary Hollywood producer Wayne Isham. Ever After High™ is already garnering early success with publishing and consumer products. The Storybook of Legends, a novel based on the property written by award-winning author, Shannon Hale, has recently topped a New York Times Best Sellers list and a second book for release in spring 2014 is already in the works. Other consumer products, including apparel, accessories, stationary, electronics and more will be rolling out to retailers around the world over the next year. At the enchanted boarding school of Ever After High™, students learn to follow in their parents' fabled footsteps, until Raven Queen™ (daughter of the Evil Queen) questions her storybook fate of becoming the next Evil Queen (who is supposed to poison fellow classmate Apple White™ — daughter of Snow White). Raven Queen™ rallies her classmates to question their own pre-determined destiny. The school quickly becomes divided between the Ever After Royals™ -- who want their promised Happily Ever After and the Ever After Rebels™ -- who want to write their own storybook endings, not follow their parent's fairytale. Are you a Royal or a Rebel? The end is just the beginning! Mattel, Inc. (Nasdaq: MAT) is the worldwide leader in the design, manufacture and marketing of toys and family products. The Mattel family is comprised of such best-selling brands as Barbie®, the most popular fashion doll ever produced, Hot Wheels®, Monster High®, American Girl®, Thomas & Friends® and Fisher-Price® brands, including Little People® and Power Wheels®, as well as a wide array of entertainment-inspired toy lines. In 2013, Mattel was named as one of FORTUNE Magazine's "100 Best Companies to Work For" for the sixth year in a row and as one of the "World's Most Ethical Companies" by Ethisphere Magazine. Mattel also is ranked No. 2 on Corporate Responsibility Magazine's "100 Best Corporate Citizens" list. With worldwide headquarters in El Segundo, Calif., Mattel employs nearly 30,000 people in 40 countries and territories and sells products in more than 150 nations. At Mattel, we are Creating the Future of Play. Visit us at www.mattel.com, www.facebook.com/mattel or www.twitter.com/mattel. EVER AFTER HIGH and associated trademarks and trade dress are owned by Mattel. ©2013 Mattel. All Rights Reserved.